Pent-up anger fueled the flames of arson when forty days of anti-government protests ended on May 19 with the surrender by protest leaders to the police. The crowds that had blocked one of Bangkok’s main intersections for more than a month dispersed but before they did, violent elements in the crowd set fire to several buildings around the city in what appeared to be a deliberate and preplanned attack. 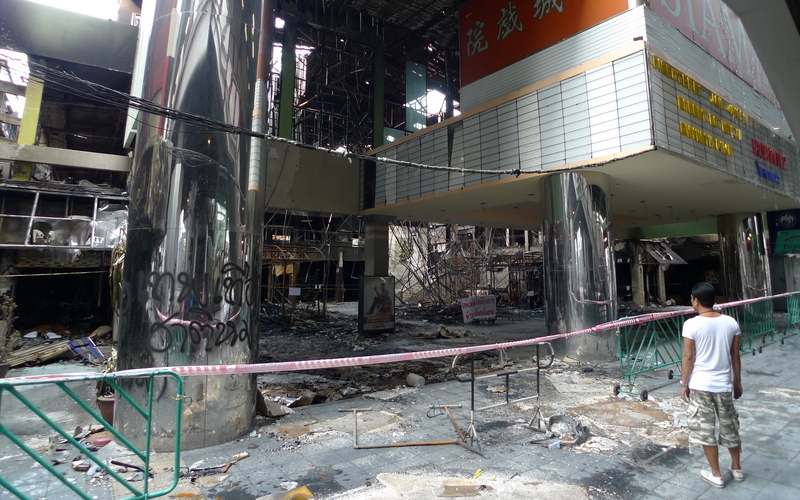 In addition to more than 80 people killed and 2100 injured during the protests, one of the victims of the arson attack was the the 44-year old Siam Theatre, which was one of only two remaining single-screen first run cinemas in Thailand’s capital. 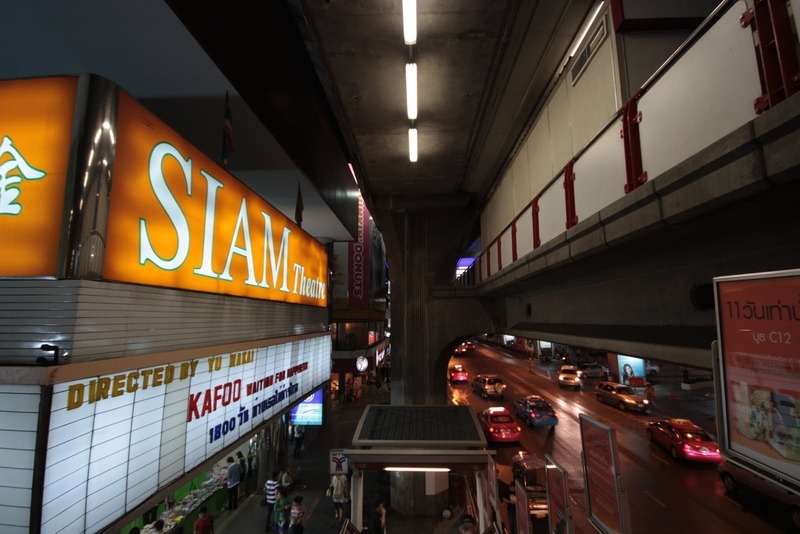 Opened in 1966 in Siam Square, one of the first shopping areas in what is now the nexus of Bangkok’s lively Ratchaprasong shopping district, the Siam Theatre along with its sister complex, the Scala, were a reminder of a bygone era. Tickets were still paper and you chose your seats from a photocopied seating chart, which the ticket cashier then dutifully crossed out with a pen. The ushers, uncles that seemed to have been working at the theatres since the very opening, dressed in black slacks, white shirts, and yellow jackets. In the aftermath of the fire, the bulldozers have moved in and started to demolish the burned out shell and surrounding shops. 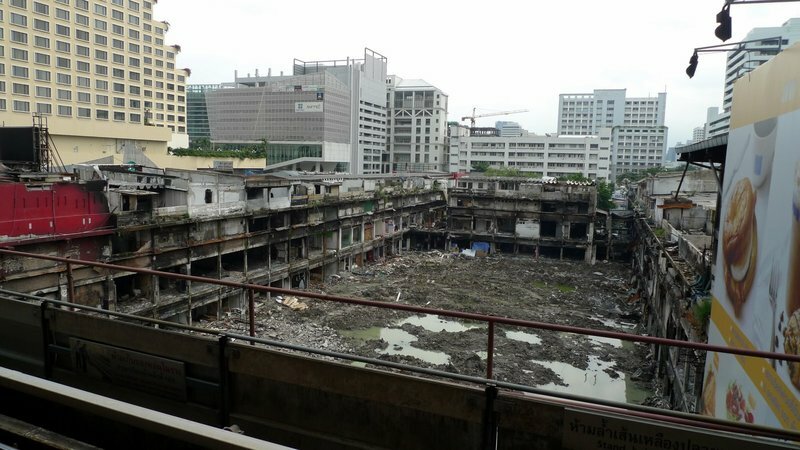 The property owner, adjacent Chulalongkorn University, has long held a master plan to redevelop this area into a more modern shopping complex as they did just down the block a year ago. Their good fortune, then, that this damage paved the way for the master plan to be implemented. One wonders why we need another mall in a neighborhood (and an entire city) that is teeming with them. Siam Square and the Siam Theatre were unique elements of the city and were especially important to teenage and university life. As I understand it from my friends who grew up in Bangkok, hanging out in Siam Square was a rite of passage in that period of life where you transition from childhood to adulthood. Another few blocks of those memories have been razed. Thankfully, the Scala Theatre and the nearby Lido three-plex, both operated and owned by the same family that owned the Siam Theatre, continue to operate. This entry was posted in Uncategorized and tagged Apex, Bangkok, Chula, Chulalongkorn, Cinema, culture, Development, Fire, Krungthep, Protests, Siam, Siam Square, Square, Theatre by christao408. Bookmark the permalink. What huge destruction brought about by anti-government protests, not to mention the number killed civilians. A great post, Chris!Many people who sympathize with the Red Shirts often criticize, understandably so, that the “upper class” / “ruling elite” are mourning buildings and the complaining about the lost opportunity to stroll around in the glitzy, air-conditioned shopping malls, while ignoring the real sufferings of the poor and those who were killed or injured during the crack down. Yes, some of their criticism is accurate. But the losses aren’t just about buildings. It’s about the soul and character of the place.By the way, have you heard about a monorail being planned to run along Phayathai Road from MBK/Siam area to Rama IV Road? So, in a sense we’ll have another connection between MRT (Sam Yan) and BTS (Siam) systems. I still remember I had my first cup of mango on ice dessert at one of the small shops inside the Siam Square, there are hundreds of mom and pop clothing stores in there as well. I hope the developer would find some appropriate niche retail shops for that neighborhood. @Poomsira – I have heard about the monorail plan/ pet project of the Governor. Frankly, I don’t see the need for it. I think the second one he discussed, connecting BTS and Airport Express via Thong Lor and/or Ekkamai makes a lot more sense.As for the red shirts’ criticism, I would have a little more sympathy if their leader’s track record on human rights was a little less spotty. Yes, all of us at all levels of society need to be more concerned with the needs of the poor and suffering in the Kingdom, but to go into anyone’s city and burn private property makes people feel violated. Not only do those places belong to people in a literal sense, they also belong to people in a metaphorical sense. So, I’ll indulge those who feel a sense of loss when a place that was important to their childhood went up in flames. @CurryPuffy – Ice Monster? @icapillas – Yeah, and the irony is that the only people who really suffered were those who could least afford to pay the price. I always wonder about the protest that cause damage or the damage caused controlling the protest. Indeed it is those who least can afford it that pay the price. Is it true is this a birthday?!?!?! This was another story of yours Chris, that illuminated the similarities we share with other peoples and cultures. Though I grew up in a small town in western Pennsylvania I had a “Siam Square” too and it’s a memory that will last a lifetime I’m sure. Your birthday is on Tuesday? Hah! I announced to the world that it was your birthday yesterday. I have it written on my daily scripture readings that November 15th is Chris Schultz’ ( thailand ) birthday. Well anyway, a very happy birthday Chris. I hope also, like Gary, that the developer would give thought to the mom and pop stores that were destroyed and re create some thing beautiful from the rubbles. 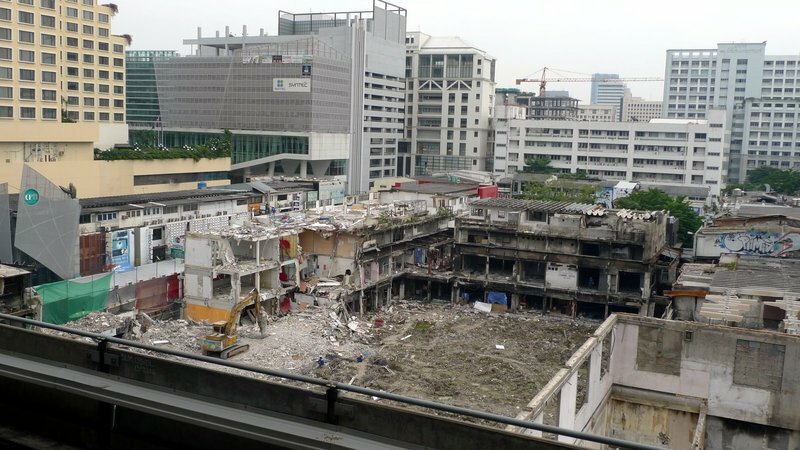 Ah yes…I remember The Siam….very sad that it is no more. Because of the time difference you ought to be just about ready to start celebrating your big day…Happy Birthday Chris!!!!! oh……..I used to go to the food court there…..hope they will mix it up soon.